Vibe³ (Vibe Cube) is a sound installation incorporating collected, donated, and archived sounds that express the “spirit of place”. Part of the Genius Loci/OpenSpace Programme, it was commissioned by Essex County Council. Between January and September 2009, residents of Colchester, Harlow and Basildon were invited to submit both recordings and ideas for recordings which reflect the history, character, and the unique feel of their area – anything from wildlife to nightlife. As well as the public submissions, artists Damien Robinson and Stuart Bowditch collected foundsounds and researched the sound archives at Essex Sound and Video Archive. The recordings were collected and redeveloped into an ever-changing sound mix, which was played back via the Vibe Cube itself. The Cube was exhibited at locations in the towns and extracts from the work have been uploaded to the Vibe Cube website. The Vibe Cube itself is not just a sound experience; using an innovative form of technology, it becomes a resonating instrument where sounds can be experienced by touch as well as heard. At the close of the original project (09-10) we donated all the collected recordings to the Archive Essex Sound Archive, to help to form a more detailed historical picture of our county, capturing it's essence during the project period and showing how it is changing. - September 17: The Vibe Cube CD was acquired by the British Library in 2017 as part of their collection. - "Four Towns" mix on show as part of Chelmsford Sensory Festival, 9-6pm, 20-28 September 2013, Rivermead Gallery, Anglia Ruskin University. You can listen to recordings made from the Cube below; each track focuses on the mix constructed from recordings linked to a particular location. Details of where and when the work was shown are at the bottom of this entry. The Open Space website which documented how the project developed is no longer active, but we published a CD featuring real-time recordings from the different mixes (see Essex sound Archive links above) and Essex County Council produced the publication 'Open Space; conversations on place, people and art', featuring an essay by artist and curator Jane Watt, and conversations on each of the four Open Space projects. The Vibe Cube conversation is with Martin Astell, archivist at Essex Sound and Video Archive. A pdf of the publication is available below. 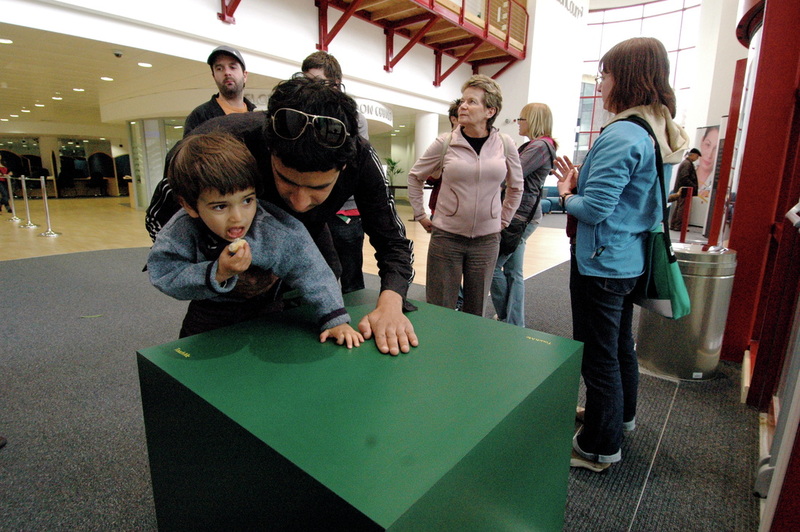 The Vibe Cube project was also developed in Southend with residents contributing sound and ideas for sounds in the run up to the cube being exhibited at TAP. See here for details. 14-18 May 09: Basildon Centre (Foyer area) St. Martin's Square Basildon. 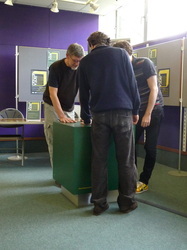 25th-28th June 09: Harlow Library (exhibition area), The High, Harlow. 23-27 July 09: Colchester Library (Les Livres Gallery) Trinity Square, Colchester. 20th-24th August 09: Essex Record Office (home of Essex Sound Archive) Wharf Rd Chelmsford. See Essex Sound Archive. - The Vibe Cube CD was acquired by the British Library in 2017 as part of their collection. The Open Space project was part of a major three year public art project ‘Genius Loci’, developed and funded by Essex County Council involving a total of fourteen art projects that develop notions of ‘spirit of place’ across the county. ‘Genius Loci’ has two main goals: to involve artists in the design teams on capital projects; and to establish new dialogue about public art with a focus on sustainability. This, it is proposed, will help improve the image of Essex as an exciting and vibrant place to live. Four Open Space projects took place across the county in 2009: you can read more about these projects in the pdf file below.